The convenience, immediacy and availability of a retail app make them a key part of any brand’s strategy to grow sales and loyalty. The app is always there, not buried away as a website shortcut, it is always up-to-date and capable of pushing the latest offers and reminders to customers. For convenience, easy checkout and frictionless delivery are key for customers. While the business can leverage the opportunity for loyalty, bonus, reward and other schemes, making the retail app essential for any size of outlet, from a coffee shop, local store to a major clothing brand. Apps also create an additional channel for customer relationships, improving communications and making those key repeat purchases easier to perform. 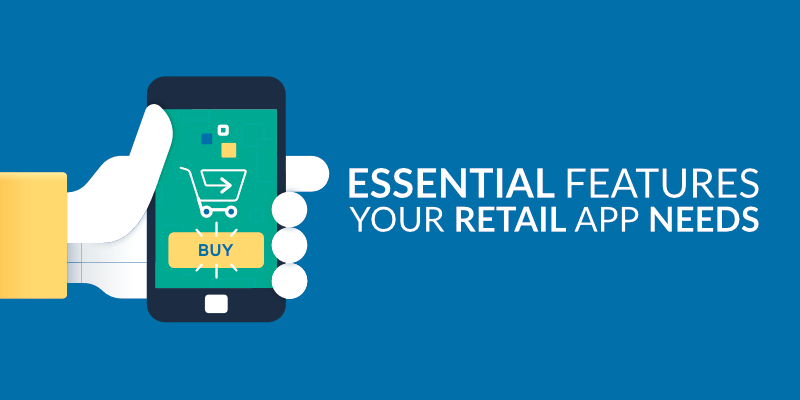 Let’s take a deeper look at the key features any mobile retail app requires. As mobile use continues to outstrip PCs, and sales focus around key dates like “Cyber Monday” apps are the focal point for retailers looking to maintain and grow sales. 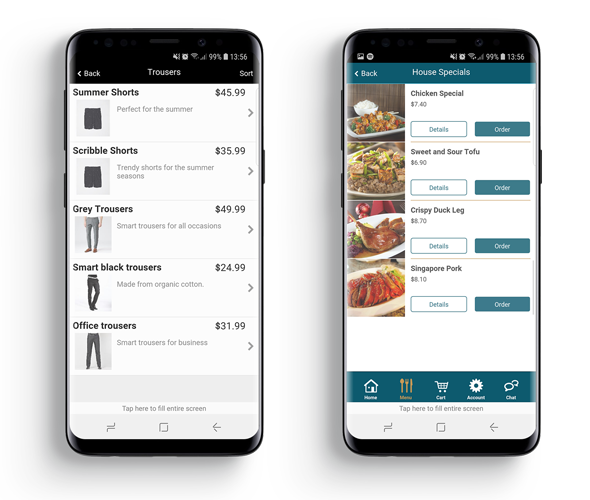 From takeout pizza to coffee shops, gaming stores, clothing outlets and trade supplies, the app is the key way to order for click-and-collect or have delivered, minimising the time spent shopping. AppInstitute has templates for food ordering, retail displays, galleries to show off unique products and much more. Your app shouldn’t replicate the website, it should be stripped down to focus on products and services – all about the store, without the fluff that most websites are loaded with. A well laid-out, easily searchable store is the key requirement for any mobile app. One that encourages people to browse and pushes likely purchases at them, will help drive sales. A favourites/recently purchased listing can make it easy to reorder consumables, regular items, and also help link to similar items that may be of interest. When in shopping mode, people are more likely to follow these trails around your app’s store than the regular emails promising “you brought this, so you might like that..” which appear as an increasing intrusion in their lives. With a well-designed store, accessible with one tap, your customers are more likely to complete purchases and come back. And, with seamless check out and a range of delivery options, you can meet their needs when it comes to completing sales and providing flexible customer service. The truth is, there are a lot of retail apps out there, and yours will be in competition with many for that valuable smartphone home screen space. Most people only regularly use around 10-12 apps, and breaking into that list is a tall order. By adding value to your retail offering, through stamp cards, loyalty schemes, coupons, regular retail offers and other means, you can improve the value the app offers. 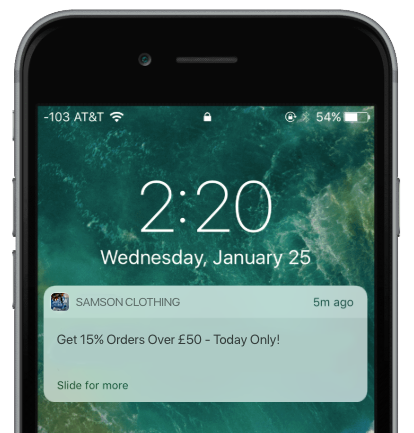 Using Push Notifications you can also alert customers to the latest deals and offers. Flash sales are an increasingly common marketing tactic to promote the store and help build its cachet as a place for great deals. A mix of these customer opportunities delivered naturally in the mobile environment help promote the app as a useful shopping tool, and make it more useful. For those that don’t have the capacity for deep discounts or regular offers, providing timely information or news about products is a different way of adding value and making the store more of a portal. Adding social sharing buttons to each offer is also a rapid way to spread the word. Whatever the message or opportunity, staying relevant to the customers’ needs is of vital importance. Shoppers expect only relevant communications from the brands they follow, whether they are Push Notifications, SMS text messages, or other targeted special offers. They need to be timely, of interest and not overly repetitive to maintain interest. In return, your retail app helps build up a better picture of the customer, making for improve and accurate message, detailed information about them, and an accurate picture of sales trends and where your marketing hits the sweet spot. Another trend that is helping push app success is shoppers’ use of the app even as they hit the streets for some retail therapy. They use apps to compare prices, find better deals or get more detail on products. Using Push Notifications, you can alert them if they are near one of your retail outlets. Or, if they are near a rival store, you can start pushing price-beating offers to get them to shop with you instead. Using these time and location sensitive measures helps hit shoppers when they are closest to a buying decision or most interested in a purchase, and help keep your app an active part of their day. Whatever your market, a retail app is a must have to attract new customers and keep existing ones coming back. While you might think you cannot compete against larger brands, the push to local and loyal services or stores sees retailers of any size benefit from an app, especially those with a particular niche, or local or regional appeal. Mobile retail apps provide a growth gateway to improved sales, as well as helping to augment the in-store shopping experience if you have bricks and mortar stores. With a focus on speed, convenience, delivery choices and providing useful information these apps will continue to grow in usefulness for the digital customer. Finally, the digital footprint of an app and its offers is massively larger than traditional marketing for most stores. Customers can share offers and purchases among their friends or colleagues, Everyone likes to spread the news of a bargain, and when it comes to key selling period from the major holidays to Black Friday or Cyber Monday, customers expect to see deals and offers that appeal, and your app will be one of the prime ways of driving sales at these times.